“Enter: Three WITCHES” features Miss Mewsette, her mom Mimi and her brother Giuseppe re-enacting a scene from Shakespeare’s MacBeth. Guess the kids have been getting into my literature textbooks again. I thought my Riverside Shakespeare was too heavy for them, but there is no getting in the way of a determined reader. Now that they’ve mastered Act 1, Scene 1 of MacBeth, I can’t wait to see how they interpret Scene 2. Maybe reading to them as kittens really did work. 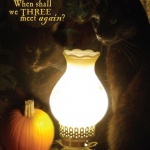 Actually, Mimi, Mewsette and Giuseppe were gathered around the lamp “to keep warm” as they said, because the temperature was all of about 65 degrees. Time to get out the cozy beds! 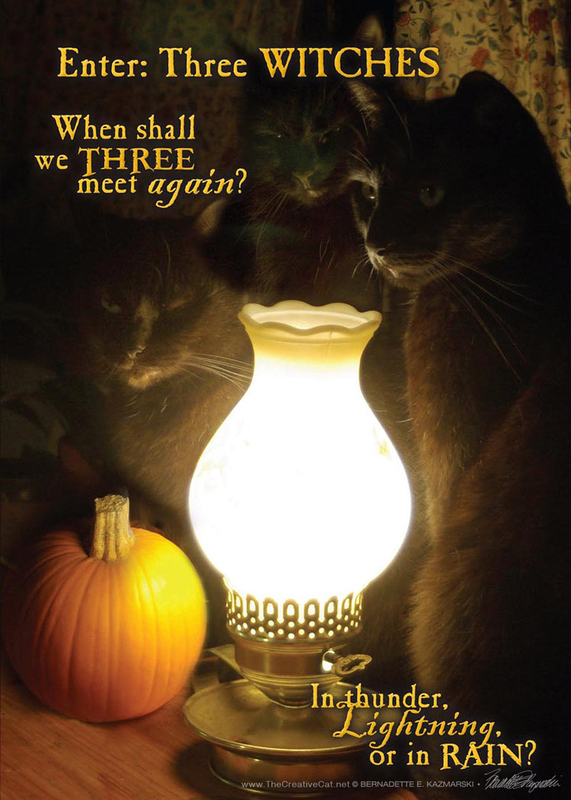 This entry was posted in black cats, cat greeting cards and tagged black cats, cat greeting card, halloween, shakespeare on October 10, 2016 by Bernadette.